SEGA® and Sanrio announce the launch of the first phase of the Sonic the Hedgehog x Sanrio collection at select Sanrio stores and Sanrio.com starting on December 15. 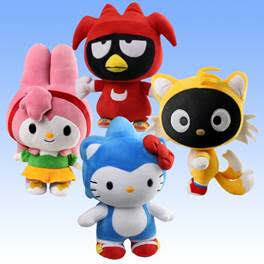 The initial collection will include 10-inch plush featuring mash-ups of SEGA’s Sonic, Tails, Knuckles and Amy with Sanrio characters Hello Kitty, Badtz-Maru, Chococat and My Melody. The second phase of the collection will feature expanded categories including plush and collectible vinyl figures from Toynami and include variations of co-branded SEGA and Sanrio character designs. Launch details for the second phase will be announced later in 2017. Also launching is a limited four-week in-game event for the hit mobile game Sonic Dash, which has been downloaded over 220 million times. Throughout the month long event, fans can race through Sonic’s world as they play as My Melody, Chococat, Badtz-Maru and Hello Kitty. Players can unlock the Sanrio cast of characters by completing the in-game challenge each week. Once unlocked, the Sanrio characters will be available for play into perpetuity. Download now for free on the App Store for iPhone and iPad, Google Play, Amazon Underground and forWindows Phones. To stay current on Sonic the Hedgehog news, follow Sonic on Twitter, like him on Facebook, and subscribe to the Twitch Channel and the YouTube Channel. For the latest in Sonic fashion and toys, follow the Instagram account @SonicStyles.